When first loaded, sensor data is not made visible, since with any reasonable volume of sensor data the plot quickly becomes illegible. Sensor data is switched on and off individually by accessing the sensor, via its Track, from the Outline View. For each Track being plotted, the display mode looks to see if it contains any Sensor data. It then examines each list of Sensor data to see if it's visible. If it is visible, it plots the current sensor contact (nearest to the Tote time), followed by the sensor contacts as disappearing contacts running back through the length indicated in the TrailLength parameter in the properties window. Generate track from Active Sensor Data. If your sensor data has both range and bearing, you have all the data you need to generate a target track. If you right-click on a Sensor, or on a block of sensor cuts in the Outline View then Debrief will inspect them to see if they are suitable for generating a target track. Specifically it will check that they all have a Range value, a Bearing value, and no ambiguous bearing. If the selected data matches these constraints you will be invited to Generate Track from Active Sensor Data, and Debrief will generate a new track, named according to the sensor that produced it. Modern command systems produce high volumes of sensor data, and a command system that just uses a 3-digit track counter can easily go 'around' the clock when allocating track numbers to contacts. Debrief provides capabilities to both ease the challenge of deciding which sensor data is related to a specific target, and to automatically split a single sensor track in multiple tracks when they clearly relate to different targets. With lots of sensor data it can be increasingly difficult to determine which tracks should be made visible - the plot below shows just 12 visible tracks - it's possible to have many hundreds of tracks..
Also note that whilst by default comes up with a unique color/symbol combination for each block of sensor data, you can click on the 'Show original colours' palette icon at the top of the view. This will switch the Bulk Sensor Manager to using the sensor data color as configured via the sensor manager. For data from a command system that frequently 'wraps around' the track counter, when the data is read in Debrief will mistakenly assume that the data is all for the same contact: so the data will show as a continuous series to the left of the chart, then there'll be a jump over to were that track number is used again against another contact on the right hand side. Debrief offers a tool to automatically split sensor data - the scissors icon at the top of the Bulk Sensor Manager offers 'Auto-split sensor segments'. 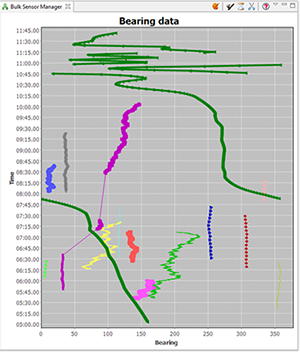 It will pass through all of the sensor tracks in the primary track, and if there is a jump of more than 15 seconds Debrief splits the successive data into a new tracks. The original and new tracks are then renamed with a "_1", "_2" suffix. In the above screenshot you can see that the purple dataset actually covers 3 periods of sensor data, roughly: 0545-0640, 0710-0720 and 0830-1010. If we click on the Axe toolbar button ( , Auto-split sensor segments), then we will see the tracks separated as in the following screenshot. 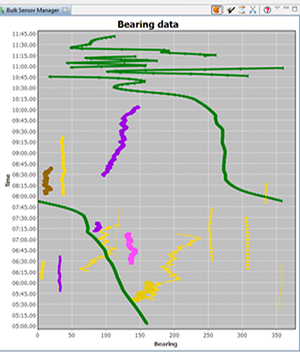 Sometimes the data extraction process results in sensor datasets being loaded/provided that cover time periods outside the range of the parent track. These unnecessarily slow down Debrief - so you may choose to delete them. The Trim to track period( ) operation will delete any blocks of sensor data that completely fall outside the time period of the primary track. These two operations shade the selected block of sensor data (or whole sensor) according to two operations - as shown below. 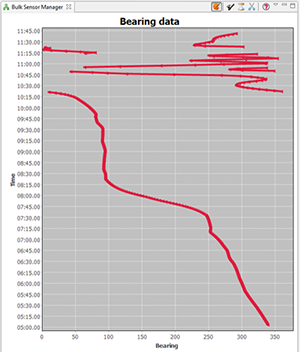 As you'll see in the earlier Cumbersome sensor plot, a lot of sensor data can make a plot difficult to interpret. If sensor data isn't provided with a range attribute, then sensor lines are drawn out to infinity (or the edge to the viewport - whichever is nearer...). On a large area plot this may given sensor lines of 10s of nautical miles long. If in truth the detections are only in the thousands of yards, you may wish to give the sensor data a range. 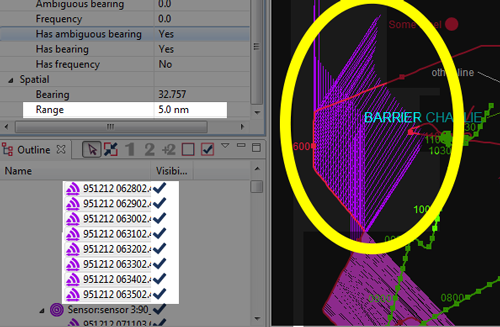 To do this, start by multi-selecting a block of sensor data in the Outline View. Next, open the properties window - you'll see the elements have zero range. Just insert an 'indicative' value for range. The sensor lines on the plot will now be clipped to that range - greatly reducing plot clutter. Note, the Sensor Range Plot reflects the sensor offset length, plus whether the 'Worm in the hole' (see Section 11.1.3, “Worm in the hole”) property is set for each sensor. Now, back to the Outline View - multi-select the new sensor, and the target track. Right-click on them and select View sensor range plot. 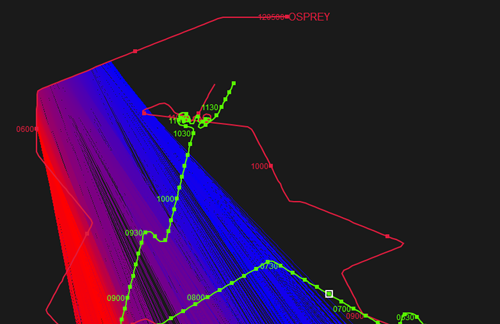 In this mode of use, the algorithm generates a range for each calculated position on the target track. In the normal mode (where we have sensor data), a range is calculated for each point at which there's a sensor cut (using interpolation to determine the position of the target track). Debrief is able to produce a plot of multiple sensors against on track, or the range from one sensor to multiple tracks - but it can't calculate the ranges for multiple sensors against multiple tracks. That would be just ridiculus. Your brain would explode, honest. 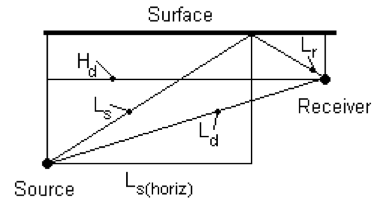 Whilst hull-mounted sensor typically produce a single bearing to their contact, towed-arrays typically produce ambiguous bearings. They are aware of the relative bearing to the contact, but are now aware of whether it is to the Port or Starboard of the host platform. The Debrief sensor format (DSF) handles ambiguous data by allowing two bearings to be read in, and once that block of sensor data is made visible Debrief plots both sensor bearings. In order to analyse the sensor data, or use the sensor data in other analysis, the analyst must decide which is the actual bearing (to be kept), and which is the ambiguous bearing (to be removed). Once a decision has been made on which of the two bearings to keep, open that block of sensor data in the Outline View. Then, select the relevant sensor cuts (using <shift> and <control> as necessary to multi-select). Once selected, right-click on one of the items and select Keep port bearing or Keep starboard bearing. The target track must have its base frequency assigned. The data will now be written to file in csv format: first the base frequency then a series of time-stamped measured and predicted frequencies. First, load the bearing sensor data. Edit the sensor cuts (probably in the grid editor, Section 3.8, “Using the Grid Editor”) to include the highest freq data held, potentially colouring the blocks of cuts according to the base tonal that they relate to. Go through these blocks of cuts creating a solution for each block - then setting the base frequency for that solution to the respective value. You can now switch individual solution blocks on and off, ensuring the stacked dots (Section 3.1.3, “Track shifting”)will be working with the correct data values. Should you have access to multipath sensor data of a target vessel from a host platform, Debrief is able to assist in determining the target depth. In overview, Debrief allows you to compare the measured time interval with one calculated from the relevant dispositions of the two tracks (plus measured sound speeds for that location). A SVP (Sound Velocity Profile) file for the location (using the file format defined in Section 16.5.2, “SVP file” ). 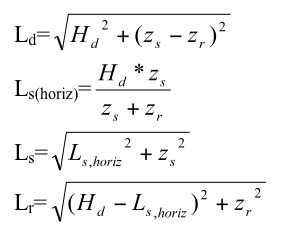 The maximum depth of the SVP is interpreted as the depth of the water column: the depth slider is uses this value as its maximum, and it is used as the maximum permissible value in the optimisation algorithm. Debrief is able to use Dr Michael Thomas Flanagan's (at www.ee.ucl.ac.uk/~mflanaga, [note: external link]) Nelder Mead simplex optimisation algorithm to determine the optimum target depth to minimise the least-squares error between the calculated and measured curves. Perform multi-path analysis using the Multipath analysis view. Open this view by selecting it from the Window/Show View menu. As you'll see from the above screenshot, the panel is laid out with a series of controls above an xy plot. 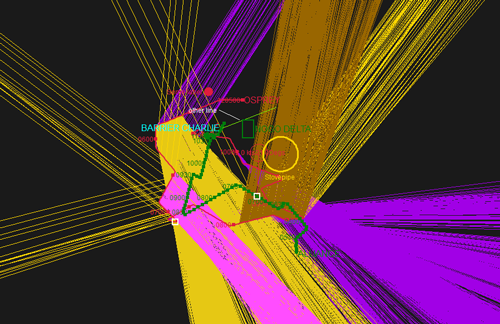 The controls at the top of the view indicate the files being used for SVP and time-delays, a slider control is provided to let you trial target depths, plus there's a magic button that runs an optimisation algorithm - generating a best-guess of target-depth by minimising the time-delay error. So, start off by dragging in your SVP and time-delay files - dropping them over the respective [pending] label. Next, ensure your 'ownship' track is marked as the current primary track, and your target track is the secondary track in the Debrief Track Tote (as explained in Section 4.1.2, “Assigning tracks”). Once you've loaded the data and assigned the tracks, the slider control will become enabled and you can drag it to trial new target depths. 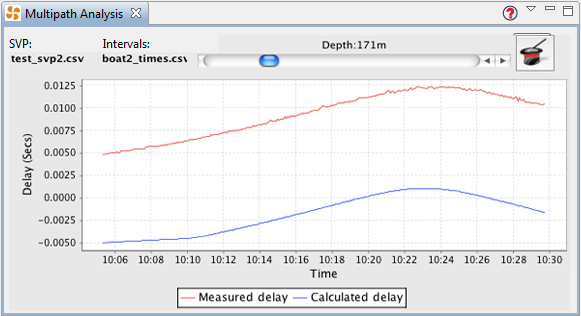 The xy plot will update to show a comparison of the calculated time delays against the measured delay. You'll determine the target depth estimate by using the slider to place the blue (calculated) line as close as possible to the red (measured) line. An alternative to working out the estimated target depth by eye/experimentation is to click on the magic top-hat icon. A Nelder and Mead simplex optimisation algorithm [note: external link] will now run - with the slider set to the result on completion. Should you be interested in the performance of this iterative optimisation algorithm, a summary of each step is placed as an information message in the error log (viewable by selecting Window/Show View/Error Log). The log will show the 'score' for each target depth trialled - normally only around 10-20 depths are necessary to reach an optimum. 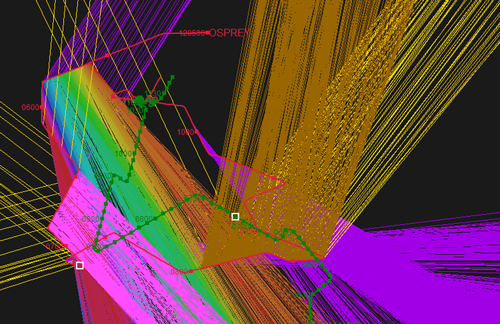 Note, during development, on occasion the optimisation algorithm failed to produce a realistic target depth. On each occasion this was a symptom of there not being a valid result in the available target range (0 to 1000m) - which itself was symptomatic of invalid data files: dropping the data-files into the wrong 'slot' or mistakenly using units different to those specified in the reference (see Section 16.5.3, “Time delays file”).